One of the co-founders of craft brewery giant BrewDog will host a Masterclass event at this year’s Taste of Grampian. Martin Dickie has joined forces with the annual food and drink festival to offer fans the chance to hear from one of craft beer’s trailblazing brewers. He will be joined by BrewDog’s Master of Quality, Dr Fraser Gormley, in the Brewfest Marquee at 1.45pm on Saturday, June 2, in what will be the company’s first year as an event sponsor. Martin Dickie, BrewDog co-founder said: “We’ve been huge fans of Taste of Grampian and the awesome passion, innovation and excitement for craft beer it fuels. “We’re stoked to be able to support the dedicated beer fans that have helped to spearhead the craft beer revolution by our side for the past decade. Plenty of BrewDog beers will be available for fans across the day, served up from BrewDog’s 7.5 tonne shipping container-turned-mobile-bar. 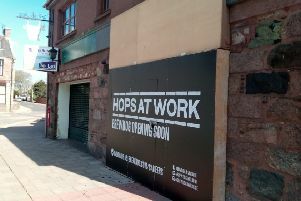 Crew from BrewDog’s team will also be on site for those interested in learning more about what it’s like to work for the brewer. BrewDog’s craft distillery, LoneWolf, will also be joining the festivities as Head of Distillation, Steven Kersley, takes to the stage hosting a spirits masterclass at 4pm. The masterclass will showcase LoneWolf’s various craft gin styles, including Bathtub, Gunpowder and its signature LoneWolf gin that launched the distiller in May of last year to huge success. Spirit fans will be offered the chance to try the exclusive Taste of Grampian Gin distilled especially for the show. Taste of Grampian will run on Saturday, June 2 from 9am at Thainstone Centre, Inverurie. Tickets for both the BrewDog and Spirits Masterclass are priced at £12 each and visitors for these classes must be aged 18 or over. Entry to Taste of Grampian is £8 (free to children aged 16 or under and accompanied by an adult) and tickets are available from EventBrite.co.uk.